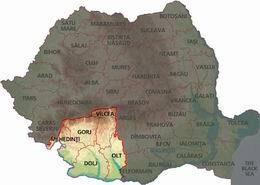 Oltenia Region, S-W of Romania, the territory between the Danube, the Olt river and the Southern Carpathians is historical province. Oltenia region have 5 counties: Dolj (important town: Craiova), Valcea (Ramnicu Valcea), Olt (Slatina), Gorj (Targu Jiu), Mehedinti (Drobeta Turnu Severin). The climate is temperate continental. This region has three zones of relief from north to south: in the north the southern slopes of the Valcan and Parang Mountains and the south-eastern slopes of the Godeanu and Mehedinti Mountains, in the middle of the province the Sub-Carpathians of Oltenia, the Getic tableland and the Targu Jiu intrahills basin, and in the south the Oltenia plain. 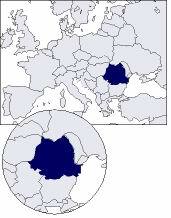 Since the 14th century, Oltenia has been the center of southern Romanian kingdom. No wonder that Oltenia was always a place of major importance, politically, as well as spiritually. Across the centuries, Wallachian kings, as well as local rulers, used this beautiful natural setup to build churches and establish monasteries. Spending your vacation in Oltenia will be a wonderful opportunity to fill your soul with unforgettable. The splendid landscape of the pass created by the Olt river can be one of the most beautiful memory of your life. Oltenia carpets are famous because of their refined ornaments; you will admire all kind of birds (hoopoe, chicken, duck, geese), flowers, characters of the village, dance and many other amazing patterns. The capital of Oltenia is Craiova. This town is the seat of the Dolj county and it is placed in the Northern part of Oltenia plain lying on the left bank of the Jiu river. This geographic zone was inhabited since the Neolithic. Also Dacians had in the neighborhood an important settlement called Pelendava. In the year 225 A.D. was the first time when this place appeared on a Roman map. In the 16th century Craiova was raised to the rank of a town and in the 18th century it was considered the second most important town of Wallachia. But the number of its people decreased dramatically especially at the end of the 18th century because of epidemics and fires. The military tradition of Oltenia's men was never forgotten. In 1821 many inhabitants participated to the revolution against the Phanariot regime (that started in Wallachia in 1716). The main feature of Craiova during the two first decades of the 19th century was an economic flourish determined by the increasing of interest in the handicraft, commercial trade field and in public services. Craiova was regarded as an important university, commercial, administrative and cultural center. During the czarist rule (1828-1834), Craiova continued its economic development. That is why in 1832 documents recorded here more than 595 shops. There were exported animals, cereals, furs to Austria and Turkey. In 1846 in this town was set up the first Romanian stock company for the transportation of cereals by ship.